Slava Koulikov saw his Peterborough Phantoms men complete a quickfire hat-trick against Sheffield last night (January 8), but then issued praise to the beaten team. Phantoms eased to a 6-3 success at Planet Ice to retain their third spot in the English Premier League table although their performance against seriously short-benched visitors was not completely convincing. Phantoms defenceman Tom Norton checksSheffield's Liam Kirk. Photo: Tom Scott - AMOimages.com. The suspension-hit visitors were even more depleted than when losing 10-2 last Sunday and 6-1 last Monday to Phantoms due to injuries. They were only able to ice 11 skaters, but more than matched their hosts – whose own 17 skaters featured three Islanders call-ups – Callum Medcalf, Nathan Long and Brad Moore – for the final half of the game. “We needed two points from the weekend – and we got them,” said Koulikov. “It is not an easy time for us as we’ve got guys injured and there is a bug going around as well. Phantoms star Wehebe Darge in action against Sheffield. Photo: Tom Scott - AMOimages.com. 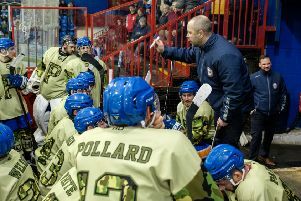 “I also have to give credit to Sheffield for the way they battled when playing two-line hockey due to being so short-staffed. It took less than two-and-half minutes for Phantoms to hit the front as Ales Padelek rifled a powerplay blast past visiting netminder Brandon Stones. The city men doubled their lead on another numerical advantage when Owen Griffiths gobbled up a rebound after a Darius Pliskauskas shot had been spilled. Only some errant finishing, smart Stones work and an unfortunate block from Wehebe Darge on a goalbound Tom Stubley drive prevented further additions to the scoreline in the opening session. Returning Phantoms netminder Janis Auzins was a spectator apart from when having to keep out a Tomas Brcko effort. The shot-stopper otherwise had to amuse himself with a ‘sweeper-keeper’ role by regularly leaving the confines of his crease. The game looked set to follow a similar pattern in the middle session, which was only six seconds old when Petr Stepanek hit a third Phantoms goal. Marc Levers then added a fourth before the hosts’ dominance was replaced by sloppiness which saw their advantage halved. Auzins’ hopes of a shut-out were dashed when Liam Kirk stylishly struck for Sheffield just before the mid-point of the contest. Only a couple of fine pieces of Darge defensive work prevented the Steeldogs from adding to their tally soon after, but the visitors did make a five-on-three powerplay count courtesy of a rasping Arnoldas Bosas shot. Given Phantoms blew a four-goal advantage to suffer an overtime defeat at the hands of the same opponents earlier in the season, the Bretton faithful had every right to begin biting their nails. But they needn’t have worried as two powerplay goals in the final two minutes of the period from Sam Towner re-emphasised Phantoms’ superiority. Despite the two sides managing 24 on-target shots between them in the final stanza, there was only one further addition to the scoreline. It came courtesy of speedy Steeldogs import Adrian Palak, who zoomed in to rifle past Auzins on another numerical advantage. But it was of no significance in the grand scheme of things. Far more worrying for Koulikov will have been the sight of a groggy Scott Robson after the defenceman was on the receiving end of an open-ice hit during the closing 20 minutes. Phantoms have back-to-back away clashes next weekend. Koulikov takes his side to Swindon on Saturday (January 14, 5.45pm) ahead of a Sunday (January 15, 5pm) trek to the Blackpool-based crisis club Manchester Phoenix. Phantoms then stage the opening leg of their EPL Cup semi-final clash against table-topping Telford on January 18 (7.45pm). They have another home outing against Hull, in the league, on January 21 before travelling to Shropshire for the semi-final second leg the following day.